Viewers receiving satellite television services from the pan-European Astra 1 satellite position, which carries predominately German, French and Spanish language services may be affected by overnight blackouts. Satellite operator SES Astra is currently carrying out regular tests to check the performance of the Astra 1 satellites, which orbit the earth at 19.2 degrees East. According to information published by the Bavarian public service broadcaster BR, "all transponders on the satellites will be switched off for up to 30 minutes". To minimise the impact on viewers, the switch-off is staggered over different nights. a516digital understands that the nightly tests have already begun and resulted in the brief disappearance of some channels on the Astra 1 satellite system - they usually take place around 01:00 GMT/02:00 CET. 8th February 2017 - 01:00-01:30 GMT. 14th February 2017 - 00:30-01:00 GMT. In the UK and Republic of Ireland, this information is only relevant if you have a satellite system set up to receive additional channels. This does not affect Sky or Freesat. 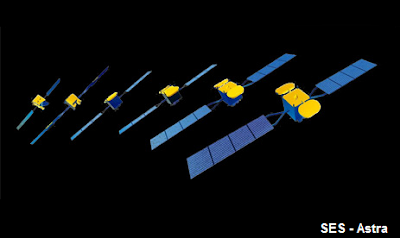 For UK viewers, the Astra 1 satellites are only used as a feed source for a very small number of channels on IPTV and cable networks. During late February and early March, satellite viewers will need to be aware of sun outage periods, where for a time during mid-mornings, the sun's position will be directly behind the satellite, resulting in a risk of a poor signal for a brief time; around 10-10:30am GMT for the Astra 2 satellite cluster used for Sky and Freesat for viewers located in the UK.